It's hard turning the couch into a bed. We have a two story house, and it would be hard going up and down steps getting things, making sure things ok, and taking things to Kristina day and night. Especially difficult making sure her foot is resting up on pillows above her head. That way her foot doesn't swell while she has her foot in the cast. It was difficult after getting Kristina situated on the couch. Then again, we had to find places to put all of the balloons, flowers, fruit baskets, and cards. Oh, I forgot the giant teddy bear! Never knowing a tough daddy's girl could ever want to just be held, I had to find enough room for me to fit on the couch. I loved seeing the need for a mother's touch. I hated what happened to bring that need out of her. I still get a sick, awful feeling when we drive by the road where the wreck was. The phone would ring when people who couldn't visit would pray with us on the phone. We didn't have to cook dinner for two weeks. Our church and friends took care of us. I had a lot of thank you letters to write. The kids from her class at school also wrote get well cards. The teacher brought them by the house one day. While Kristina was looking at the cards, the teacher and I had to set up a schedule for a tutor to come to our house. Why does there always have to be someone to make things look worse when things are starting to look better? One of the cards was from a boy in her class. That card was Mean, Horrible, and Disgusting. 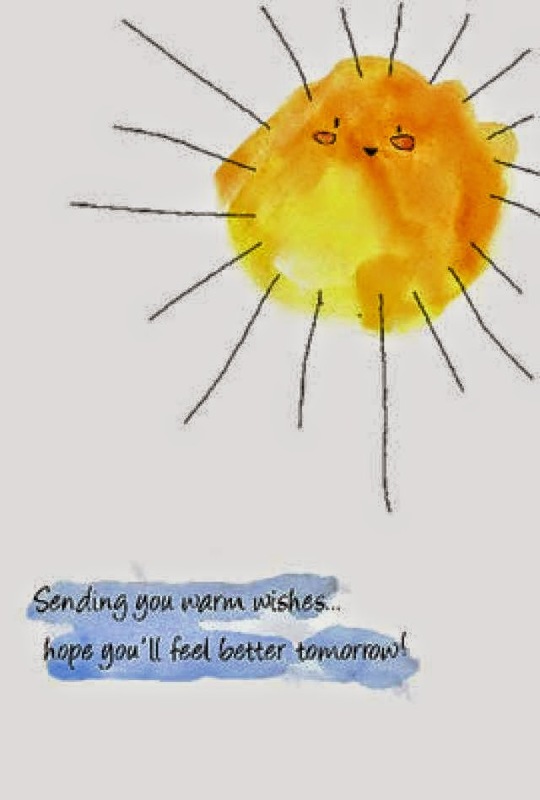 On the outside of the card was nice "get well". On the inside, was hid (something like), too bad you didn't get hurt worse. It wasn't signed. We gave it to the principle. The only thing I could think of, why someone would write something like that, they must be miserable and have to make others feel worse than they do. I remember certain things that happened. I wonder if Kristina remembers things that I forgot. We were only in the hospital one week. One week felt like infinity. Everyone had to make me leave the hospital. They said to go get some sleep in your own bed. I finally gave in. One night in my own bed, but who would sleep? Thoughts running through my head and they wouldn't stop. Making it back to the hospital, I see a smile on my daughter's face! A SMILE! The first time that week I finally felt like God was listening to my prayers. Everyone from the church would come by and pray. This time the prayers pushed through the ceiling. Learning how to get out of the bed and getting into a wheelchair, Kristina had to get out of the room. The room started getting smaller and smaller. The pediatric floor at the hospital had a pool table. Had a pool table! I lost to a girl in a wheelchair, with a leg sticking straight out, to a game of pool. She still laughs about that. Finally getting the cast put on her foot and having blood flow going to her toes, we got to go home. Being discharged takes forever! It did give us time to load balloons, flowers, cards, stuffed animals, and fruit baskets into the car. I can't forget the crutches to take home for the future. We didn't get home until later in the afternoon. We had a SURPRISE OF A LIFETIME!! My husband volunteered at the fire department. The people that work there get close and don't just rescue strangers. They come to help each other like family members. Two fire trucks were out of commission with firemen that were volunteers or off that day. 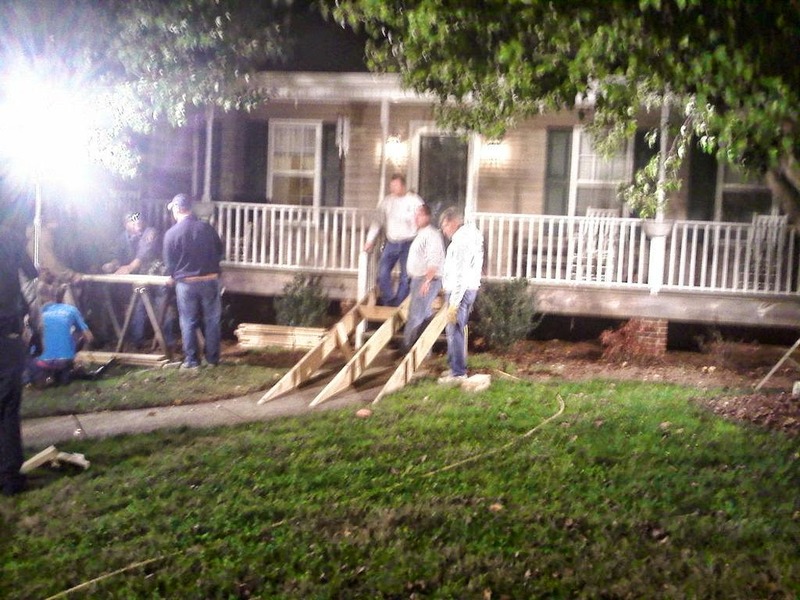 They had been building a ramp all day. 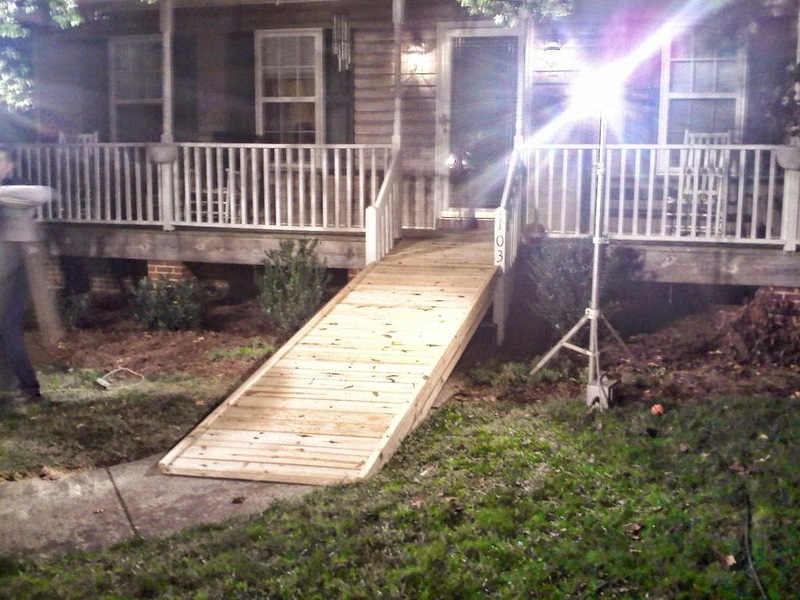 A ramp to the front door to bypass the steps to the front porch. Working hard that day, it started to get dark. All of a there was LIGHT. Light from fire truck. I think that there are friends that shine a true light inside. They do what they can when others are in need. Do you see those lights?